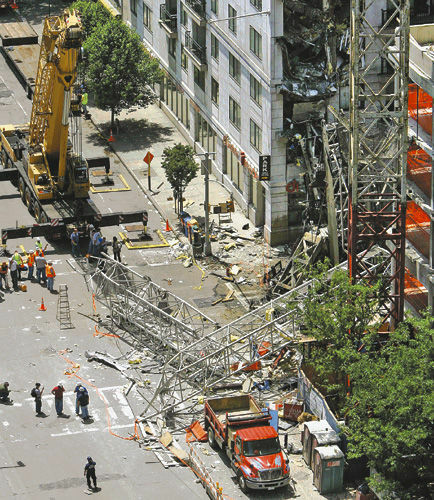 The long legal battle that ensued after two construction workers died in a crane collapse on 91st Street and First Avenue in Manhattan in 2008 just took another unexpected turn last week. After the owner of New York Crane and Equipment Corporation, Jame Lomma, was cleared of all charges in a criminal prosecution in 2012 a judge just declared a mistrial in the civil lawsuit against the construction magnate because he was hurt in a bad car accident and was still in the hospital. The families of the victims, Donald C. Leo, the crane operator and Ramadan Kurtan, a sewer worker, who were suing James Lomma for wrongful death, will have to wait at least until September to pursue their fight for justice.